Roma Termini is the main railway station of the capital and the first in Italy for passenger flow. It is situated in Piazza dei Cinquecento and owes its name to the nearby Terme di Diocleziano (Baths of Diocletian). 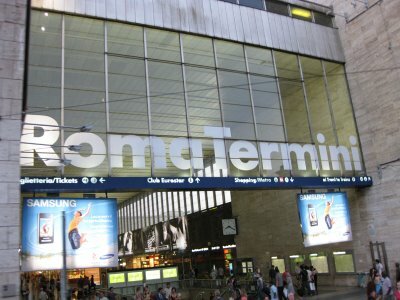 Roma Termini station offers services and links designed for tourists and Roman citizens: the station is now the central hub of the north-south link of Italy and of the transport in the city. 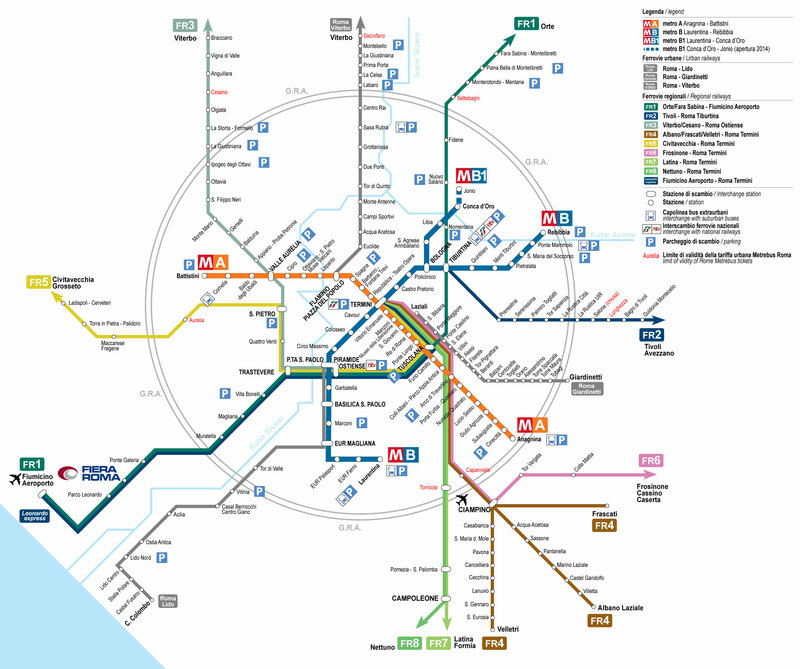 The to/from Roma Termini connections include transportation for each category: high speed, Eurostar, Intercity, national, international and regional trains, trolleybuses, trams, buses and subway. Mobility map from Termini station to Rome and province. The platform 24 is used for train Leonardo Express, direct line to Fiumicino airport leaving every 30 minutes. 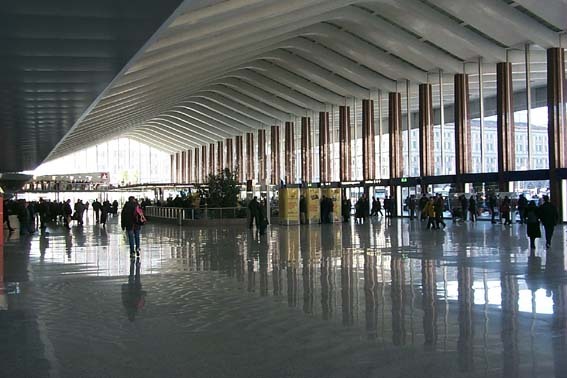 Termini station is also connected to Fiumicino Airport via shuttle bus service. From Termini you can reach Ciampino airport via shuttle bus from Termini or using a regional railway line to the station of Ciampino and then an Atral shuttle bus to the airport. Termini station is also the meeting point of all the city’s subway lines: Line A (Anagnina – Battistini), Line B (Laurentina – Rebibbia) and Line B1 (Laurentina – Conca d’Oro / Jonio soon). By subway from Termini you can easily reach destinations such as the Colosseum, the Vatican and Piazza di Spagna. – 110 OPEN bus for the city tour. To reach the Rainbow Magicland theme park you get to Valmontone station by train and then continue with the free shuttle bus. For Ciampino and Fiumicino airports or other tourist destinations, like Zoomarine, you can use other transport companies like Terravision or TAM Bus. Inside Termini Station there are many services including Forum Termini a large shopping center located in the basement of the station. Where can I get the schedule to get from Roma Termini to Zoomarine and back. There is a shuttle bus service from Roma Termini Via Marsala (in front of Caffe Trombetta): 9:30 AM. Round trip ticket price is 12€. No other kind of tickets. There is another way: Cotral bus from Roma Laurentina to Torvaianica. Hello, we have a plane in March at 7:45 am in Rome Ciampino and I’m trying to find the fastest way to get there. We are staying in Colli Albani subway station, but considering the first metro leaves at 5:30, go to Anagnina station or Termini station to take a bus to the airport faster? I would like to get to the airport at 7:00 … I have seen the schedules of Atral, Terravision, etc. But even so, I do not know if the Termini-Ciampino or Anagnina-Ciampino route is better. Thank you! I would definitely suggest you the route Anagnina-Ciampino and in case you will be late a taxi ride will definitely be cheaper from there.